With both curtains pulled back the kitchen opens gracefully to the dining area. “Mark dreams of being a TV chef,” says Doris Mitsch of her husband, Mark Barden. He loves to cook for guests and when he does, the beet juice flies. “Guests expect it to be quite a show,” says Mitsch. Architect Kurt Melander devised an ingenious solution: He opened up the wall between the two spaces and installed curtains as dividers to screen the kitchen when necessary. Normally, they’re pulled back to create one bright, airy room. 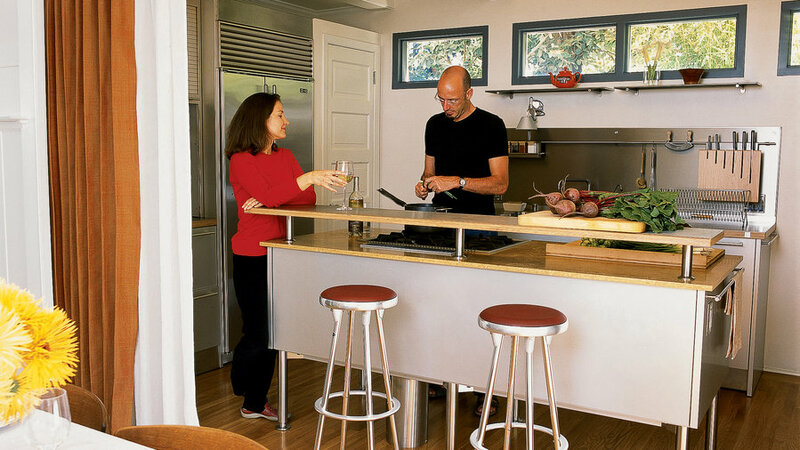 Melander duplicated the dining-room beams in the kitchen to draw the spaces together. The beams, which are painted the same color as the ceiling, provide texture and definition without breaking up the space. At the center of the kitchen is an island containing the stove and oven. It’s treated as a freestanding piece of furniture, which adds to the feeling of spaciousness. New French doors create an easy connection to the deck and garden. “We couldn’t even see the garden before,” explains Mitsch. Cabinet doors roll up and down instead of swinging out. “We don’t have to ask people to move so that we can open them,” says Mitsch. And there are compartments and drawers for dishware, utensils, and appliances. The other curtain, a heavier fabric in a rust color, is reserved for cold winter nights―”when we want to hunker down and get cozy,” explains Barden.